© 2017 by Giovanni De Feo. That’s how Cynthia and Ugo met. The Easter egg hunt had just started when little Cynthia noticed a dark, short-haired nine-year-old boy, all alone, sitting by the church steps. Her first impression of him was his quietness, and the way he stared at her. When she told him (well, shouted) that it was impolite to stare at strangers, and why wasn’t he running like all others?—the dark-haired boy walked quietly over and told her that they didn’t need to hurry, for the grand prize, three enormous chocolate eggs, was located right under the picnic table that was set up for lunch. And as for the staring, she was no stranger to him. Every time Cynthia saw him, she missed the ball. Her blunders sent waves of mirth through the opposing team. This went on for quite a while until—ears red—she marched up to Ugo and asked him to leave. Suddenly his cool was gone like a blanket snatched by the wind. Behind it, he looked red-faced, raw and trembling. It was painful to watch. He left without a word. But his reaction had so impressed her that, after the match, she went to look for him. She found him sitting on the top of a wall like a child Humpty Dumpy, looking every bit as fragile. Years later, Cynthia had only a vague recollection of what they talked about that day, probably cartoons they both liked. He told her he had a bike that could go faster than the wind. She in turn told him about ice skating, her passion; her mother said she would become a star, one day. At that, Ugo glanced at her sideways, as if he wanted to say something but couldn’t. When she asked him why he got so upset when she asked him to leave, Ugo smiled. He couldn’t figure out how, in just an hour’s time, they would end up here, considering what would happen next. Cynthia frowned. What would happen next? “This,” he said, and kissed her on the mouth. It was an adult kiss, with lips and tongue and teeth, one so shocking, so unexpected for a nine-year-old that Cynthia froze on the spot. When it was finished, he quietly hugged her. They stayed like this for so long that Cynthia felt her feet growing numb. His body was thin, and yet it was so warm she felt scorched down to her bones. “Now we are together,” he said. It turned out the whole kissing business had been a Leap. That’s why he had behaved with such certainty: He had to play his part to the end. This was the really unsettling bit of Leaping. For when he came to the moment in time he had experienced beforehand, he still felt—in his mind—the presence of his younger self, watching. Later on, Ugo developed a theory about it. He said that in reality everybody Leaps all the time. The proof? Déjà vu. The feeling of having already experienced what is in fact happening for the first time was for him the ultimate, definitive evidence of Leaping. The only difference between Ugo and everyone else was that he remembered, while we don’t. Why? Because our brains are incapable of retaining the memory of the future. But then how was he able to? He didn’t know. Bit by bit, Cinzia came to the conclusion that his mind could hold the future because deep down he was so desperate to escape the present. Ugo moved to Cinzia’s neighbourhood when he was eight. His parents had just divorced, after the failure of Ugo’s father’s sports career (he was a basketball pro). His mother was an Italian meteorologist who held a PhD from Reading University but didn’t have a job in her field. She got by translating cookbooks, which I always found quite amusing since she couldn’t fry an egg to save her life. She came from a large family from a town near Naples, and spoke with a strong Italian accent Ugo had somehow inherited, though to a lesser extent. By the time his family moved, two years had passed since his first Leap at the age of six. The first time Ugo skipped ahead in time happened in a parking lot, right after his father hit him for losing a soccer match. Since then, Ugo had Leaped twenty-three times. Most Leaps were short, lasting a couple of minutes. But three had been quite long, and one huge. Ugo called those bigger spells “vacations” (I will tell you everything about them later). They lasted instants in “base-time,” but weeks or even months in his mind. Not only that, they put a mark on him, a feeling of otherness that never left him entirely. There was something in Ugo that was always out of place. Sometimes people didn’t react to his presence, as if he weren’t there at all. Even at his best, he was always out of sync, a creature caught between two worlds. Sometimes he struggled to talk like a child. School came easily to him, especially math. What was really difficult for him was social interaction. He could only warm up to people he had “seen” in his future, of whom there were very few. With the others, he behaved as if they were ghosts. Which in a way, for him, they were. With time Cinzia experienced both sides of Ugo’s Leaps. She was there when his mind fugued, and she was there when he was possessed by the younger version of himself. With the latter, usually there was a hesitation she had learned to recognize. The worst, though, was when he came back from his longer explorations. These were his “vacations.” Instantaneous in base-time, they lasted weeks in his mind. In these cases, he had got stuck in his future-self. Until something triggered a memory of the exact time period when his Leaps started. Right at that very moment, he came back. Violently. Before their marriage, Cinzia had experienced only two of these episodes. One, in middle school, was really nasty. They were at the Berkshire Spring Fair, bargaining for new ice-skate blades, when Ugo’s eyes rolled back and he collapsed. She caught him easily, thin as he was. He came around quickly; cold and rigid at first, then all of a sudden warm again, hugging her so tight it hurt. He never explained what he meant, or his out-of-character display of public affection. For they had agreed since the first kiss to hide their relationship. Adults don’t believe in the loves of children. They would show their mutual affection later on, so that their parents could gradually adjust to the idea of their early marriage. For months after that episode Ugo acted more strangely than ever. He snapped easily, at home as well as school, at other students and even at teachers. Only Cinzia understood what was really the matter. He was resentful of being treated like a child again. “Is that what we look like to you? Little babies?” said Cinzia. On the last day of middle school, while we were celebrating with a furious battle of water-balloons, one of our classmates, a boy called Norwitz, darted out of the parking lot and was hit by a lorry. While we waited for the ambulance, we sat in shock on the curb. The teachers did their best to calm us. Many of my classmates were crying, boys and girls alike. It was then that Cinzia saw Ugo. There was a funny expression on his face, something she had seen before. Ugo didn’t say a word but his eyes looked frantic, trapped. “I-it doesn’t work like that,” he said, slurring his words. She wondered who was talking, the older or the younger Ugo? He said nothing, but she could feel the anguish in his eyes, the impotence of his silence. She turned away from him. “It is always good for nothing,” he said, and his voice was so full of despair that she was almost pleased. But then she realized. The frightened look belonged to the younger Ugo, watching. But the one talking, this one knew. In fact, he had always known they would break up on the last day of middle school. She turned and broke into a run. They would not speak to each other again for three years. High school came in like a storm. More and more she felt she understood what it felt like to be trapped among babies. Only in her case the babies were boys, while the Tall Ones were girls. And they didn’t look like children anymore either: They branched out under the boys’ eyes, taller, fuller, their shapes changing, shifting, blooming. Hormones came, and so did her first blood. Her father chortled his amusement at lunch when they told him, and her little brother moved into her small room and she took her big sister’s, who moved out to Christchurch. She remembered the pains of trigonometry, her discovery of the Romantics (oh Byron! and Shelley! ), Laura expelled for smoking hash, the first time she really felt her breasts. She had her own group of friends outside school, mostly girls who figure skated. The competition was terrifying, but she kept on winning. She had something to prove, and not just to herself. Ugo had never come to see her skate when they were together. Now he didn’t miss a single practice. He would sit here with his red cap and stare. But now, under his gaze, she didn’t trip. She was tall, muscular, strong; her clumsiness had melted away, while he still looked so fragile, almost brittle. She had lots of boys, of course. The first high-school kisses were such a disappointment. She became notorious as “the tiger.” Well, if they couldn’t kiss, at least she could bite them back. After all, Cynthia had been French-kissing since she was nine. Those bubble gum smooches tasted like water to someone accustomed to spirits. She felt the same insipidness in their tentative touches, in their “grown-up” talks. They were the opposite of Ugo, pretending to be adults when they were really just children. At times she wondered why she bothered. But she knew why. Because, if she stopped, she would go back to him. Patryck was in Year Twelve and was different from anyone she had dated. He didn’t pretend to be older; he was just himself, a boy with a witty talent for language and a weird sense of humour. All the class talked of how he had once stood on a table in the canteen and recited in full a poem he had written himself. Cynthia loved him for that, especially because the last lines were about her. Together they went to Oxford for picnics, to Jericho, by the river barges, her arms all white with mosquito cream, as he stood up and read poems to the swaying willows. His kisses were different from Ugo’s: tender, soft. In spite of his Celtic brooding, there was no anxiety about him. In this regard he was quite the opposite of her time-traveller, edgy on the outside and quiet within. In her last year, Cynthia decided she wouldn’t continue to Uni. She wanted to become an athlete, not a scholar. Of course her parents didn’t agree. Her dad was a German teacher, her mum worked in university administration. They said she needed to “keep her options open,” an expression she despised. Patryck, though, was very supportive. He said that, for example, in poetry only losers get PhDs. Like those who added “PhD graduate” on the back covers of their books, as if it mattered. He was all riot and turmoil, her sweet poet. On the day of the selection for the European Figure Skating, Patryck didn’t show up. It was a very important competition, and for the first time, she failed. She was seventeen, young for many other disciplines, but almost too old to reach peak performance in ice skating. The horrible part was that nothing had gone wrong; there were simply too many others who were better. When she left the rink, she was trembling all over. Why wasn’t Patryck there? She kept looking for him until she saw Ugo, by the exit. They hadn’t seen each other for over a year. The clumsy adolescent was gone, replaced by a tall, dark-haired stranger. It was like his body had finally caught up with his eyes. Was he sorry for her failure or apologizing for his behaviour? Both, maybe. But there was a third meaning that she would only understand later. She found out through friends they had in common. On that very day, Patryck had sat the tests for prep school and passed. He was going to Uni after all. When Patryck finally showed up at her house to apologize, with a bouquet of flowers and a poem on his lips—Cynthia’s little brother was laughing himself to death—she opened her window and threw a bucket of cold water on him. He sputtered and cursed and then left, his Celtic pride wounded, never to be seen again. Had Ugo known about all this? Probably. That night, she phoned him. They stayed up until five o’clock in the morning, Cinzia (who was not Cynthia any more) whispering into the receiver under the bed sheet, pretending he was there with her. “Do you want me to come over now?” he asked. His silence was an answer. She could feel his silent laughter pressing on the receiver. “Whatever you say,” he finally responded. His voice cracked, she could hear the splinters in his throat. There had always been two of her, Cynthia and Cinzia. The former was how she would have been if she hadn’t she met Ugo. In the months following that phone call, she realized that being Cynthia had been only a “vacation,” like one of his, only to a parallel universe where Ugo’s presence was unaccounted for. Which, of course, was impossible. Cynthia and Cinzia were two very separate identities. Still, they were part of a unity, a unity that stretched over time. Cynthia had not known how her life could turn out. But Cinzia knew they would marry. And knowing made all the difference. “Will we have children?” she asked him. In time, she learned a good deal about the small things. They would have a dog, a German shepherd named Jericho. Their first house would have a huge hawthorn bush that would catch fire at their first barbecue. She would buy a second-hand Vespa from the sixties that she would paint pink (Cinzia was too masculine to be afraid of pink). Bit by bit, all these things came to pass. Cinzia wondered: Did they choose the flat with the hawthorn bush because he had told her about it or because it was meant to be? Did she buy an Italian scooter to fulfil his prophecy? Did any of it matter at all? High school ended on a rainy June day that left them soaked and kissing fiercely on her porch. They had both decided to get jobs, temporary job manager him and council clerk her. That was earlier than almost everyone they knew, but that independence went with the early marriage they had always foreseen for themselves. Sometimes her parents complained; they called her new apartment “her room,” as if she were still the reclusive teenager they knew before. Yes, her daily routine was complicated by ice skating, and she always came home very late, knackered, incapable of speech but for some low grunts. But the truth was she loved her adult life, even her strife; it was her own. Ugo took care of her tenderly, taking her clothes off, carrying her to the steaming bathtub. On Sundays, they stayed in bed until noon, eating sweets and letting the sunlight slowly fill their bedroom. They married in the church where they had met ten years and one month earlier. Later, Cinzia would remember a day full of light, even if all her friends told her it that in fact it had rained. She didn’t care. That day there was enough light for all the rainy days to come. They struggled with money, but most of all Cinzia battled with the constant stress of her sport. She had come to resent it so much that she sometimes talked of quitting. He would shake his head and tell her that skating was her life, she would feel empty without it. “I know it’s part of your present,” he said, stroking Jericho. “And of my future,” she said, frowning at the dog’s antics. He was always right, as if he had seen how it would end. And actually, he had. Things started to change soon after that. In six months, Cinzia won three European skating competitions. The money was sufficient to pay for her training, so she quit her temp job. An important skater, Davor Timuresku, invited her to train at his rink. Cinzia commuted to London every day, taking the seven o’clock train. It was still dark when Ugo helped her pack her cucumber sandwiches, Jericho licking his hands. When they kissed at the train track, she felt like one of those war-spouses saying goodbye to her husband. There was some tension too, of course. Her parents said she was stressing out too much, that she slept way too little. Ugo, too. Sometimes his support seemed less enthusiastic, like something that was expected of him, something he had to do. In those moments she had a hard time fighting back her irritation. Was Ugo behaving like that because he knew she would fail? Or was he resentful of her success? Finally, the big selection to enter the new Winter Games came. The International Skating Union would choose a team of six female figure skaters to represent the UK in Turin at the Olympics. Her dreams had never been so close, never so terrifying. Sometimes she stayed up at night, unable to sleep, watching Ugo’s white body afloat in the deep waters of a dream. Knowing that her husband knew, that inside he was preparing either to celebrate or to console her, was unbearable. At times she wanted to rip his dreams open and look inside them, to see the colour of their blood. The day of the ISU selection, Cinzia looked at Ugo like the citizens of Delphi must have looked at their Oracle just before a battle. The way he dressed, the way he spoke, the way he moved, were all harbingers of her success. It’s not like she didn’t understand or appreciate his efforts. But he knew. He knew whether her passion would carry her far or if she would just stay behind. The selection started. She performed a combination of loop jumps and a cherry flip, scoring very high on the Grade of Execution Table. When the applause started she was beaming, her parents in the stands in tears. She looked at Ugo, but his smile was that of a sphinx, a mirthful bow to eternity. In spite of this, Cinzia was relaxed. The second contest was a series of axel jumps, with two extra rotations, something she excelled in. She started well, storming her opponents with her flawless tempo. Yet as she landed on her last axel, she suddenly lost her balance and fell. A deep sigh from the crowd. She grimaced. Not only had she lost vital points, she felt her ankle swelling up. She started to cry. Not out of pain but out of fear. In the infirmary, Timuresku was implacable. If she continued, she could damage her ankle. Permanently. It was her choice, her risk. She looked up in despair, only to find Ugo at her side, staring at her. So that was it. She quietly asked Timerusku and the nurse to leave. Her coach gave her a sharp look and walked out. As soon as the door closed, she let it out. It wasn’t a scream but rage liquefied, turning to sound just outside her mouth. Ugo jerked back, or rather, the small kid in him did. After that she spoke in a low, coarse voice. Even before she finished, Ugo’s features were seized by such a violent anguish that it seemed his face was coming undone. He had the same raw nakedness she had first seen on the badminton field, only on an adult it looked obscene. His voice was also different, not just slurred but child-like. When he made an effort to speak it was as if every word was a shard of glass, it sent tiny shivers all through his face. “What do you mean,” I said, slowly standing up. It wasn’t easy, with the searing pain in my ankle, but I had too much to prove. I couldn’t afford to lose; and I didn’t. The young woman who came out of the infirmary was certainly not Cinzia, but not even Cynthia, for even the latter had lived only in the absence of Ugo. And he was gone now, gone so completely it felt like he had never been there. I wasn’t surprised when I didn’t see him in the cheering crowd, nor with my parents later on, when we celebrated with Timuresku and our staff. For, in the end, he was right. The moment I was freed from his future, I could realize my own. I had won. I would compete in the Olympics. My life was on course. I was happy my parents were tactful enough never to mention Ugo. As for me, my feelings were tangled. There was a mix of regret, guilt, but most of all relief. I felt a terrible anger for having being deceived by such childish nonsense, and for so long. And yet, I had to admit that my husband’s exit had come at the best time. When I finally returned to our apartment, I was astonished by how thoroughly he had removed himself from my life. Not one picture, not one shirt, not even his smell remained. I wasn’t surprised he had also taken Jericho; the dog had always been more his than mine. So I went back to live with my parents. No one ever talked about Ugo, I think not to upset me. I was in fact so concentrated on the task ahead I might not have noticed if they did. The frantic six months before the Olympics were the most terrible time of my life. I lived the life of a monk. The only things that existed were the rink, my skates. It’s not that I never missed him, but his revelation had become suspended inside me, like a kite in a glass sky. Had it really happened? Had I married a man because I believed him to be a time traveller? Was he insane? Or was I? Sometimes even my memories of him seemed unreal. My wedding ring had left no mark. That’s how I felt: unwritten, a frozen lake before the first skater scarred its surface. What is it like to realize one’s childhood dream? Very few people find out, and I should feel fortunate. And yet, how bitter is it to know that by achieving something, you have to lose something else. And how harsh, knowing you won’t be able to share your discovery. For the loneliness of a winner may make a good story, but only a winner himself would want to listen to it. So in the end, I went to the Olympics and won two medals, one bronze and one silver. On the last day, I had seventeen job offers, the weirdest of which was to be the ice skating trainer of an Emir. Do they have ice in Arabia? I had won, but in the process my soul had grown thin, like the last of the butter spread over too much bread. Exhaustion was my second name. I kept falling asleep in the most embarrassing places. When the plane from Milan landed in Gatwick, I wanted nothing else but to get into a hot shower. And yet, in Reading, there were journalists waiting at the train station. I was answering their questions when I suddenly realized that I had expected him to be there. Hadn’t my victory also been his? In the days right after the competition, I had come to see Ugo’s revelation differently. For, in the end, he hadn’t lied to me, but to the little girl I had been. And to what end? To woo me, to make me believe a story that we shared together. His withdrawal had been so complete it was startling. Not a phone call, not an email, not a text message; not even after my victory. So when I saw that he was not there, I started to feel a strange, pulsing dread. I kept dozing in the taxi, something that alarmed my sister (I had slept fifteen hours just the day before) until we finally passed through my neighbourhood. I had a brief glimpse of Ugo’s flat. Had he already moved out? I asked my sister, but she frowned at me and didn’t answer. Apparently his name was still taboo. I was happy to hear so many friends’ voices on the answering machine. Yet his wasn’t there. When I finished my shower, I finally felt ready. I dialled his number. A recorded voice told me the line was disconnected. That was a bit of a surprise. I called the landline. Nine rings; nothing. A slithering anguish began to crawl around my neck. Still in my robe, I went down and asked my mother what had happened to Ugo. It was the first time I had mentioned him in seven months. What horrified me was not her answer, but her blank stare. My father came in, bespectacled and scruffy. Then I knew. All that followed was just a part I had to play, excruciating and unnecessary. I told them I didn’t feel the need to sit, and where was my husband, please. My voice had already begun to shoot up; little bro and big sis came down immediately. I knew what they believed, but their unwillingness to address the subject maddened me. So I became more and more insistent, until finally my mother said it. There was no husband. I had never known a boy called Ugo, I never dated him, I never married him. There was no Ugo. I fled upstairs. In my room, I took off my robe and—naked—I started to look for my old pictures. I rummaged desperately, looking for a picture of Ugo when we were little. There were so many photos, saved from our shared flat. Yet I couldn’t find him. I was in all the pictures; he wasn’t. I kept on looking until I found the Easter egg hunt picture. That was our very first picture together, one so clear in my brain I could have drawn it with eyes closed. But when I opened them, there was only me. This is where I would love to tell you that—the following day—I filled my bathtub with hot water and slashed both my wrists. It would have been appropriate, at the very least. But I am a Brit and in our despair we are often underwhelming. It was worse, of course, the slow dark tide trapping me in a corner of my room where I rocked back and forth, gnawing at my fingertips till they bled. It lasted nine weeks. When at last I came out of it I didn’t need to be told I needed to see a doctor: I went to the hospital on my own. Dr. Buchanan is a tall black woman of fifty-five, and I liked her immediately. She knew who I was even before I began to explain what had happened to me. Afterward, she told me that she had read in the local papers that I had had a breakdown because of the Olympics. I asked her what she thought of it. She smiled at my directness. In the days that followed, my life was put under a magnifying glass. Dr. Buchanan listened attentively to my side of the story. She was not only very surprised at how extensive my memory of my “imaginary husband” was, but that often while I told my story I spoke about myself in the third person, and even called myself two different names. I shrugged. That didn’t feel special to me. I had done it so since kindergarten. This, she said, was typical of schizo-affective behaviour. I associated that word with split personalities and homicidal rages. It turned out it meant the inability to see thoughts for what they were, mistaking them for perceptions: voices, smells. Sometimes these intrusions became coherent, bringing on sub-personalities. However, such a detailed delusion, an entire past with an imaginary human being, was uncommon. That’s why she wanted to consult with some colleagues, and could I be admitted for observation? So here I am, the self-hospitalized athlete, estranged from family and friends. I spend my days in this room reading and writing, as Dr. Buchanan has encouraged me to. By writing Ugo’s story, I might not only remember it better, but give it a new meaning—she said. That’s why she told me to write it all down as if it was a story. I know what she wants to get at. She wants me to write his story so that I can see it is a fiction. I won’t tell you that I’m not tempted. Maybe it’s the medication they are giving me, but remembering Ugo has become more difficult. What did his hair smell like? What did it feel like when he was inside of me? Did he talk when we made love? I have this image of a boy whispering in my ears. I know what the doctor would say, that this is a personification of schizophrenia, murmuring intrusive thoughts I’ve taken for memories. It’s like waking up. So many flashes come to my mind now. The way sometimes people reacted to Ugo, ignoring him completely. My friends’ surprise when I talked about him. The plain fact I didn’t have any friends in common with him. I can’t remember a single time when I was with a friend and with Ugo. How is that possible? And my wedding day: How is it I can’t remember any details except that it was a sunny day? And then our shared apartment, our daily lives. My parents told me I never left home. How could I in fact hold a job, train for ice skating, and pay the rent at nineteen? How likely is that? The doctor says I didn’t just “make up” a person. A part of my mind created a whole parallel life, the ideal way I wanted to live my youth. In love, independent, married, with a future that was mine alone. Until, on the day of the Olympic selections, the ideal world of my childhood came into conflict with my ambition. Why did I want to talk with Ugo alone? Because there was no one there but me. But no. That’s what they want me to believe. That Ugo was the invisible companion I conjured up from my lonely childhood. This is where his imperfections save me. His aloofness, his infuriating smile, all those traits I’d always resented: How could I have made them up? The greatest objection to his existence came from my sister. If, in his Leaps, he couldn’t change the future, and if he saw we had a lifetime together, why had he made his revelation? And why did he disappear after that? Oh, but can’t you see? This is exactly why I still cling to him. Only now I understand what he did. The moment he realized the Olympics were my life’s dream, he fought to change what he had seen, to reshape my future so that I could win. But why did he do that? He had already seen that in the end we would be happy together, that my words were just a momentary fit of anger. Or maybe . . . maybe what awaited us was not what I thought. That was my idea of romantic marriage, as a teenager would imagine it. But Ugo saw what it really would be like. All our dreams fulfilled and then broken, one by one. Can you imagine what this could do to a child? Seeing how love will end, how routine slowly would erode everything you believe in? Is that the reason why he hugged me at the Fair, after his long Leap? Was it because he missed the girl I had been, replaced by the acerbic wife I would be? In the end, he acted like the romantic he truly was. Instead of giving me our shared happiness, however brief, he gave me its absence. I’ll never know what our shared life would have been like; and therefore it will stay intact, an untouched horizon inside me. 1. In Italian, Cinzia sounds like Cheensia and Ugo like Oo-go. Luckily most called him Hugo. Giovanni De Feo, a Clarion 2016 graduate, is a fabulist writer in the tradition of Italo Calvino. 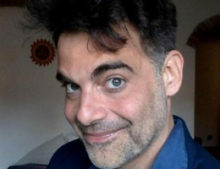 His Italian novels have been described as “a baroque cross between Terry Gilliam and Miyazaki.” He has published short stories in English for Conjunctions and Nightmare, among other venues. An IB literature teacher, he’s also a storyteller and a screenwriter. Next year he will be on sabbatical leave to complete his Oneiro Hike, a five-month-long trip on foot (and bike) to collect people’s dreams and nightmares through storytelling.